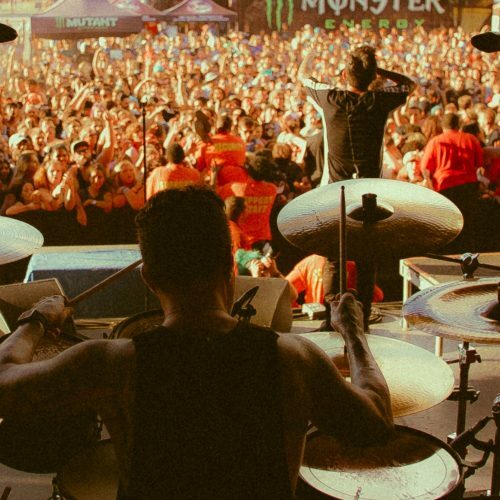 5 Best Crash Cymbals That Are Explosive! What Is The Best Crash Cymbal? This stunning Meinl Classics Custom Crash Cymbal wins first place for the best crash cymbal available. It has a perfect, full-bodied and well-rounded tone with a loud projection. And best of all, it offers unbeatable value for money. This 18” crash cymbal delivers great power and projection with incredible clarity. This cymbal blends in seamlessly with any musical style, and it has the power to be played for heavy styles of music as well as being balanced and warm enough for pop, funk and hip-hop. The premium B10 bronze alloy is lathed to a brilliant finish to provide a bright punch with rich, musical tones. The cymbal has an immediate response with just the right amount of sustain to make this a highly versatile and premium sounding cymbal. This cymbal has a comparable sound and brightness to the Zildjian A Custom and Sabian AAX range of cymbals, but this cymbal is half the price of these competitor offerings. For the money you really cannot beat this cymbal. It’s the best crash cymbal that ticks all of the boxes. Up next on our list we have this sublime Zildjian K Custom Dark Crash Cymbal and it is a medium-thin weight model. The K Custom line is Zildjian’s flagship range of premium cymbals that have a dark and complex character. This 17” crash cymbal bursts to life with an array of beautiful sounds. It’s explosive, dark, rich and complex. It has a lower pitch yet it still has high-end qualities that give it a strong presence and enable it to cut through instruments within various musical genres. This cymbal is forged from B20 bronze and is hand-hammered by expert Zildjian craftsmen to provide this cymbal with a highly musical voice. After the initial crash explosion, the sounds decay quickly. It’s a highly articulate and versatile cymbal with a buttery smooth sound that is just so inviting to play. The Zildjian K Custom line of cymbals represent some of the best cymbals available, and this 17” dark crash is one of the finest in the series. It is in my opinion the best crash cymbal at the premium price point. Here we have an excellent mid-range crash cymbal produced by Swiss manufacturer Paiste. This 18” crash cymbal has an explosive and full-bodied sound that truly offers amazing value for money. The Paiste PST7 range of cymbals are hand-lathed by Swiss craftsmen for an authentic and traditional sound. They have the sound qualities of a far more expensive range of cymbals because their high quality CuSn8 bronze alloy is the same as the legendary 2002 series. This crash cymbal opens up with an incredibly musical voice, and it really bursts to life with bright overtones and it has just the right amount of sustain. It has a medium pitch and has a good balance of bright and warm sonic qualities. The Paiste PST7 Crash Cymbal works great for just about any popular style of music. It has the ability to cut through a wall of loud distorted guitars as well as speak with a softer voice when played more quietly. When compared to the flagship 2002 18” medium crash this cymbal sounds almost identical. Overall this crash cymbal is a fantastic mid-priced option, and if you are looking for the best cymbal for the money this has to be in your shortlist. For the money I can find no faults with this cymbal, and it’s a great choice for all drummers looking to upgrade a crash cymbal or to add an additional crash to a setup. Up next on our list we have a unique crash cymbal that packs a huge punch sonically! Meinl developed this effects cymbal to be energetic and explosive for a powerful response. This crash cymbal works excellently as an additional crash that adds exciting new flavors. This Meinl Classics Custom Trash Crash is made from premium quality B10 bronze and features special holes to deliver a trashy sound with a short sustain for quick accents and punchy musical transitions. It has a thin profile and features a brilliant finish for a shimmering sound. This cymbal really packs a loud punch but with rich musical tones. It fits right in within modern music styles such as pop, rock, metal, fusion and RnB. This cymbal has a distinctive, trashy sound that adds a lot of excitement to music. If you are looking for the best crash cymbal for unique sound effects, then look no further! Lastly up for review we have a Zildjian ZBT Crash Cymbal and it’s the perfect entry-level crash for beginners and students. The Zildjian ZBT range is one of the most popular cymbal ranges ever thanks to its high quality bright and cutting sounds at such an affordable price. The Zildjian ZBT range offers the legendary Zildjian brand quality on a budget, and the cymbals are all made with Zildjian’s secret hammering techniques for an optimal sound performance. This cymbal is made from B8 bronze and for a beginner cymbal delivers some really great sounds. It has a full-bodied, bold sound with just the right amount of wash and a medium length of decay. For a beginner cymbal this crash delivers surprisingly rich sounds that is far better than other entry-level cymbals available. This cymbal also has a loud projection that will allow it to burst into life in any musical performance. For any drummer looking to begin their musical journey, this is the best crash cymbal to start off with. It fits right in with a wide range of musical styles and will equip you with great sounds to help you explore your creativity. The crash cymbal is an iconic cymbal that is featured in every musical style and is a staple part of any drum set. The function of a crash cymbal is to provide distinctive accents within music to signify the ends of phrases and musical transitions. Crash cymbals are typically the loudest cymbals available as per the name suggests, and provide a punctuated and sharp sound. They are very fun to play, but I wouldn’t be thrashing a crash cymbal without any hearing protection on. 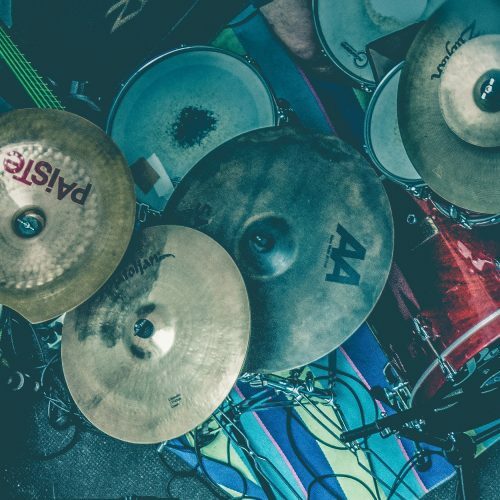 Crash cymbals help to add dynamics to a track, and they are an essential part of a drummer’s ‘tool kit’ in terms of sounds a drummer has access to from the drum set. They sound great at the end of a fill, which generally marks the transition into the ‘1’ of a new phrase. 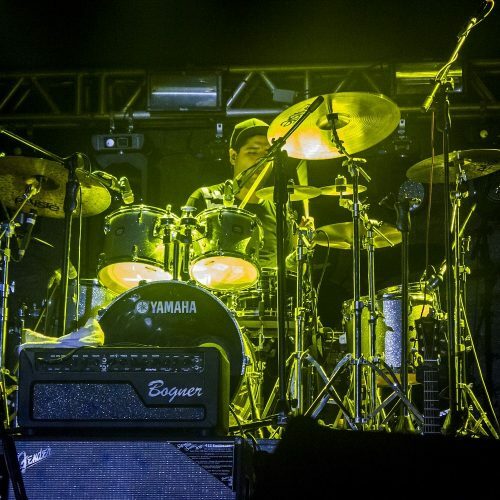 Rock and metal music predominantly feature crash cymbals within grooves and drum beats to add more aggression and power alongside the distorted guitar rhythms. When hi hats or a ride cymbal bell won’t quite cut it, wailing on a crash cymbal will add lots more intensity to a piece of music! What Affects The Sound Of A Crash Cymbal? The type of cymbal alloy used is largely responsible for the cymbals overall sound. Traditionally, the best crash cymbal is one that is made from B20 bronze: a formula that is comprised of 80% copper and 20% tin, with traces of silver. Adding more tin to a bronze alloy is known to darken the tone, and lead to a sonically richer sounding cymbal. This is why nearly all professional cymbals available are comprised of B20 bronze. 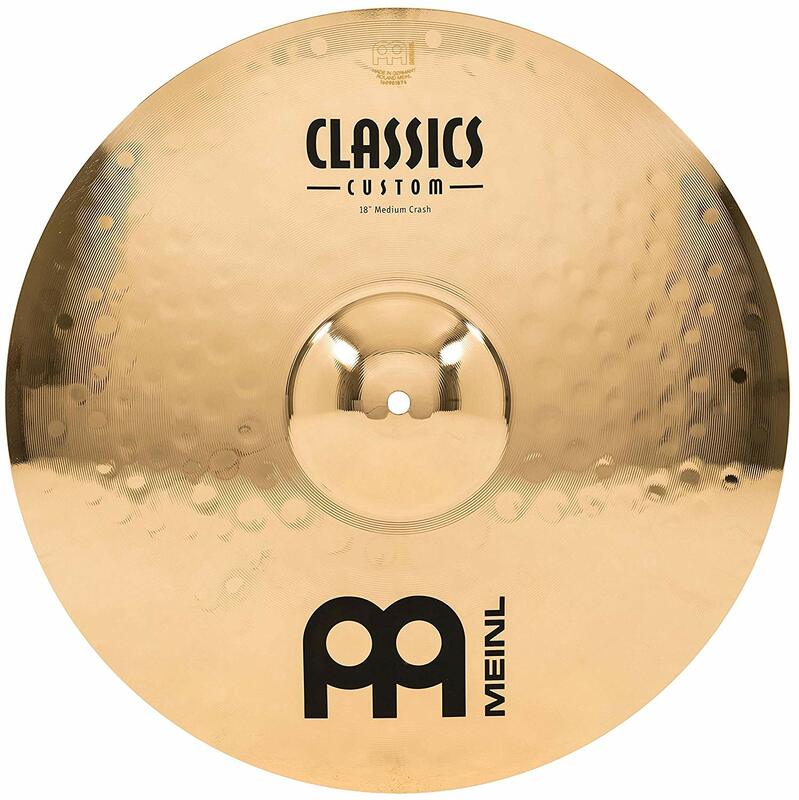 Meinl and Paiste have developed mid-priced point cymbals that are far superior to other affordable cymbals in terms of quality, tone, sound, versatility and playing response. These two manufacturers utilize B10 bronze and CuSn8 bronze respectively to produce high quality and affordable cymbals. B20 bronze cymbals still dominate the premium cymbal market, and are still the professional’s choice. But it’s important to use your ears over your eyes when it comes to choosing a crash cymbal. The weight of a cymbal greatly affects the cymbals volume, sound and power. Thin crash cymbals speak faster and are more responsive. This is because vibrations are able to travel through the metal faster. Because of this, thinner cymbals are punchier and more energetic. But with this being said, heavier crash cymbals are louder and have more projection. So in terms of volume and power, heavier cymbals can cut through music far better than lightweight models. If you are looking for the best crash cymbal to suit a wide range of musical styles, the crash cymbal you should go for will be a medium weight, which has the optimal balance of explosive sounds and loud projection. Larger cymbals have more volume and a longer sustain than smaller cymbals. Think of the short and snappy cutting sound of a splash cymbal as opposed to a 24” ride cymbal. Bigger cymbals have a bigger sound and will require more power from the drummer to activate them. The bell size of a cymbal contributes to the cymbals volume and overtones. The cymbal bell adds harmonics that can audibly be heard. A heavy crash cymbal with a large bell has richer harmonics than a thin cymbal with a small bell. 5 Best China Cymbals That Are Musical! 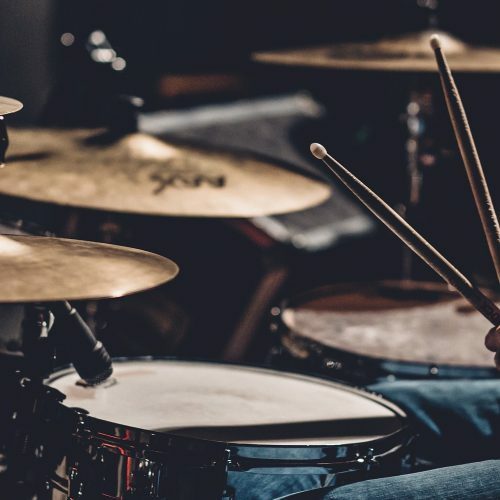 5 Best Ride Cymbals For All Styles Of Music! 5 Best Cymbal Packs For All Budgets! 5 Best Hi Hats That Are Crisp and Tight!